What Is The Best Elliptical Machine For Under $600? Ellipticals provide a nice middle ground mode of exercise between stationary bikes and treadmills. Like all fitness equipment, however, all elliptical machines are not created equal. Some are better than others, regardless of price range. What is the best elliptical machine for under $600? Easy…the Nautilus E614 Elliptical Trainer. Before I get into the review and show you why I think the Nautilus E614 is the best machine in it’s price range, I wanna make sure we are all on the same page with ellipticals. An elliptical machine (or trainer) is a piece of stationary fitness equipment with an “elliptical” arc of movement (for the legs). The motion is kind of what you would get if you combined walking and going up a flight of stairs. Exercising on an elliptical is not quite walking, not quite stairs, but somewhere in the middle. Great thing about ellipticals is that you are standing, so you are going to burn more calories than a seated exercise, but it’s low impact, like riding a stationary bike. It’s a nice combination between the benefits of a bike and the benefits of a treadmill: burn more calories, gentle on the joints. Some ellipticals include arm movement, some don’t. The stride length or arc of movement varies from machine to machine, they all feel a little different. Some machines offer the mobility to perform different types of stride while exercising, including an option to really go in a stair climbing pattern. Most of the cheaper models do not allow this. Ellipticals are a great way to get in a cardio workout. Like I mentioned earlier, they are very low impact. They are pretty safe for anyone to use as long as you can safely get on/off of the machine. When in doubt, make sure to talk to your doctor before using one. If you are looking for standing exercise but don’t want to (or can’t) use a treadmill, an elliptical is a nice alternative. In the world of fitness equipment, “under $600” definitely falls in the economy group of machines. In this price range, you are going to be aware that you are not on a commercial grade piece of equipment. That said, you can still find a machine that is high quality and going to provide you with a comfortable workout. I just don’t want anyone to be surprised that their $600 elliptical looks and feels different than the $6000 machine at Gold’s. Ok, so there ya have it. A little background info on what I like to look at when I compare products. Helps us compare apples to apples and ellipticals to ellipticals. You could also consider stride length and inclines, but most of the machines are pretty similar in these qualities. On cheaper models, you have to adjust the incline manually, on more expensive models you can typically do so electronically. Let’s take a closer look at the Nautilus E614, my favorite elliptical in the under $600 price range. The Nautilus, Inc. company has been a huge name in the fitness industry for over 40 years. The larger company includes other brands you may have heard of: Bowflex, Schwinn, Universal (and of course Nautilus). All big hitters in the home fitness industry. Nautilus prides itself in producing high quality products that are going to help people get in better shape and improve their lives. 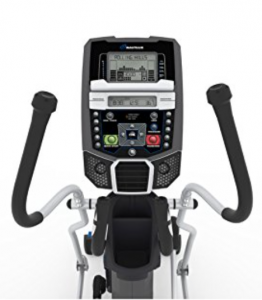 The E614 is the cheapest model in the Nautilus elliptical line up. That said, it still boasts 22 workout programs, 20 levels of resistance, and 2 LCD display windows. Some of the biggest upgrades you get with the higher level models (the E616 and E618) include: more workout programs, more levels of resistance, motorized incline change, Bluetooth compatibility, more heavy duty frame. The E614 is great because it offers a smooth, comfortable ride. Something you don’t always get in this price range. With a 300lb max user weight, you are standing on a pretty solid piece of equipment. It offers stationary and moving handlebars, great because if you are like me, you don’t always want those arms moving. Actually, taking away arms and only using legs is a great way to increase intensity during an elliptical workout. Step it up another notch by taking your hands off the handlebars all together…now that’s balance and stability. 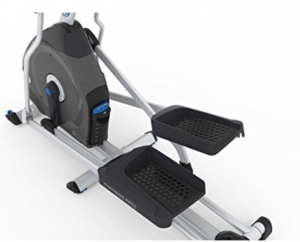 The articulating footplates increase comfort and fluidity of movement during your workout. The powerful fan and speakers will keep you cool and motivated as you burn those calories. Not to mention 2 LCD display screens, a grip heart rate monitor, and a USB port for charging. The Nautilus E614 has a lot to offer. The Nautilus E614 is an awesome machine. For the price range you are going to have a hard time finding a better product. There, I said it (again). In all seriousness though, it’s a high quality machine at an affordable cost. Over 20 workout programs, 20 levels of resistance, a great warranty, durable frame…what else do you want? Oh right, there is also the heart rate monitor, 2 display screens, and USB charging port. It’s easy to assemble and reliable. It’s manufactured by a reputable company that has been thriving for decades because of their high quality products. If you are looking for a serious elliptical at a great price, look no further, you are in the right place. The Nautilus E614 will out perform any other machine in it’s price range. You won’t be disappointed if you are looking for a great, budget elliptical machine. I hope you found this article informative and entertaining. If you are in the market for an affordable elliptical, I highly recommend the E614. If you are interested in learning about more of the best elliptical machines for home use (for every price range), check out my elliptical buyer’s guide. If you have experience with the this elliptical or have any questions, please leave a comment and I’ll get back to ya as soon as I can. What Home Exercise Equipment Do I Need? Great article. Very informative. You covered all the basics and then some. I like how you added comparisons for the reader to see how much better your machine looks compared to the others.. awesome. If I was in the market I would buy one. Thanks Deborah, yeah it’s a good product, especially for the price.